A Knifty Knitter stocking pattern makes it easy to design a unique Christmas decoration. If you struggle to work with traditional knitting needles, loom knitting may be the solution you've been searching for. 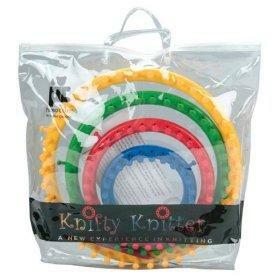 The Knifty Knitter system, manufactured by Provo Craft, is a line of knitting looms designed to help you quickly and easily make hats, scarves, mittens, blankets, and other handmade knitted items. The basic set consists of yellow, green, red, and blue round looms in various sizes. Once you've mastered working with these, you can also purchase rectangular looms or specialty spool looms to make a wider variety of projects. Read the pattern carefully before you begin to make sure it's appropriate for your skill level. If possible, try to buy a little more yarn than you think you will need. Dye lots can have small variations in color, so it's a good idea to get everything you need for the project in one shot. Pay attention to how tightly you are wrapping the pegs. A common beginner's mistake is to wrap the yarn around the loom pegs too tightly, making it difficult to pull up each row of knitting. Don't rush your project! When making Christmas stockings, it's best to plan ahead. Many crafters start in the summer or early fall to allow for plenty of time to finish their projects. Working with the Knifty Knitter is supposed to be fun; you don't want to create unnecessary stress by rushing to finish a project on Christmas Eve! Knitting Pattern Central has instructions for an intermediate level Knifty Knitter stocking pattern made in two contrasting colors. Creations by Pam sells a Knifty Knitter stocking pattern with an old-fashioned feel. This would be great to use in your home or to give as a special handmade gift. Ravelry has a pattern for a stocking that features contrasting colors. The project can typically be completed in just one day. Sew buttons onto the brim of the stocking. Embellish with colorful charms and beads. Stitch a name onto the stocking for a personalized touch. 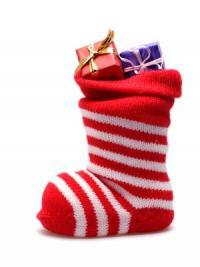 Do you love the idea of handmade Christmas stockings, but lack the patience to complete enough for the entire family? Try making the holiday stocking ornaments from Loom Knitting Designs instead! This project makes a lovely addition to your Christmas tree. If you wish, you can even use up leftover yarn scraps by making enough of these ornaments to use as decorations for your holiday packages.